My third year in Boston. Had come back to town early after Christmas at the old Homestead to work at the bookstore and movie theater. None of my friends were around. They were still away on their winter breaks. The bookstore was closed but I’d worked the whole afternoon and evening at the theater. My shift at ended at 11:30. In time to make it to a party by midnight. But I didn’t have any parties to go to. As I was walking back to my apartment down Beacon Street along the Common, the bells of the neighborhood churches started tolling together. Midnight. Voices coming out of windows and out of the dark on the streets started calling out Happy New Year! I called back and then shouted out Happy New Year to all my faraway friends and family, one by one. Happy New Year to all of you, my friends and relations! “Ancient subway cars, lined up at NYC transit museum”. Taken by an ol’ Twitter pal. Sunday. December 28, 2014. Our late comrade in blogging, Al Weisel, known affectionately and infamously by his nom de blog Modest Jon Swift, started this tradition a couple years before he died in February 2010 at only 46 years old. He rounded up links from other bloggers and posted a year end compendium that resulted in lots of great reading for blog readers and much appreciated traffic and attention for the bloggers themselves. Jon’s/Al’s blog was widely read but unlike many A-list liberal bloggers he believed fervently in spreading the wealth and many of us owe our continued presence on the web to his generosity. Since his death, the Vagabond Scholar has honored his memory by taking on the job of putting together the roundup and this year’s has posted. Lots of great posts to read and new bloggers to discover. Topics are mainly political but also include, among other things, flowers, “Crazy Women”, how to write fiction, good dogs, good students, arctic exploration, and, appropriately, absent friends. Head on over to the Scholar’s joint. Don’t forget to mention Al’s name. Probably don’t need to tell you what movie this is from and what’s going on in this scene. This is my list of movies I hope to see soon: Wild. The Imitation Game. Birdman. Foxcatcher. This is my list of movies I wouldn’t mind seeing but probably won’t get around to: Interstellar. Into the Woods. Night at the Museum: Secret of the Tomb. Big Eyes. Top Five. Unbroken. This is my list of movies you couldn’t pay me enough to see: Annie. The Gambler. And this is my list of movies I have no feelings about one way or another because I can’t believe it actually got made and released: Exodus: Gods and Kings. For all I know or care, Exodus: Gods and Kings might be the finest biblically-themed movie ever filmed, manna from heaven for the believing and non-believing movie-goer alike, with the kind of performances that cause even the savviest critics to ask “Charlton Who? Yul Who?”, although I suspect its target audience is people who never saw The Ten Commandments or even Prince of Egypt or read the bible, for that matter. The trailers look phony to me, that is, they look like parody trailers for a fake movie, like the biopic of Thomas Jefferson Tracy Morgan’s character on 30 Rock wanted to make, the one that included a climactic duel between Jefferson and King George. Something else I suspect is that the filmmakers weren’t terribly concerned about biblical or historical accuracy. I’m pretty sure the movie’s depiction of the parting of the Red Sea doesn’t look like the actual event. It happened, you know. Or it could have. I mean the parting of the sea not the drowning of Pharaoh’s army. Moses made up that part. But there’s science---or SCIENCE!---supporting the possibility that the waters parted so that the Israelites could cross on foot. I’m not kidding. Somebody’s published a paper! [The parting of the Red Sea] is, of course, thought by believers to have been a miracle -- an act of divine providence to save a chosen people. However, for software engineer Carl Drews, it might have been something else. According to Drews -- who describes himself as "one of many Christians who accept the scientific theory of evolution" -- the story of the parting of the Red Sea, as described in the book of Exodus, might have originated in real life as a weather event. "I’m arguing that the historical event happened in 1250 B.C., and the memories of it have been recorded in Exodus," says Drews. "The people of the time gloried in God and gave God credit." The idea may sound hard to believe -- and it certainly has its many detractors -- but Drews's research was conducted for his atmospheric and ocean sciences master's thesis at the University of Colorado, Boulder, published in a peer reviewed journal (PLOS One), and then promoted by his employer, the National Center for Atmospheric Research, a top U.S. research center. Taken as a piece of science that establishes the physical possibility of a body of water parting, it is solid work, says Greg Holland, a hurricane researcher and colleague of Drews who is familiar with the paper. "Did the parting of the sea really happen? We will never know," says Holland. "But Carl Drews has used impeccable science to show both where and how it may have happened." You should read Chris Mooney’s whole article at the Washington Post’s Wonkblog, No, really: There is a scientific explanation for the parting of the Red Sea in Exodus, but briefly: Drews’ contention starts from the fact that “Red Sea” is a mistranslation that resulted in a mislocation and it wasn’t the Red Sea standing between the Israelites and freedom but a “sea of reeds” which might have been a lake, specifically the Lake of Tanis, a lagoon where the Nile flows into the Mediterranean, which is shallow enough for an unusual but not historically rare weather event involving high winds to have pushed around the water in such a way to open up a temporary land bridge. If the Israelites happened to wander up to the shore of the Lake of Tanis at just the right moment they wouldn’t have seen anything on the scale depicted in Exodus: God of Kings but they would have seen what they could have only explained to themselves as a miracle. What’s interesting to me about this isn’t that it “explains” the Book of Exodus or gives the story a basis in reality. What’s interesting to me is that I heard all this before. A hundred years ago. In my sixth grade religious ed class! I’ve mentioned plenty of times that I had a rather progressive Catholic education. Our parish school was run by the Sisters of the Presentation, a teaching order, and most of the nuns who taught us had a master’s degree or were working on one. I learned about Darwin and evolution in eighth grade science class from Sister Mary Catherine who I believe was working on a Ph.D. so that she would have become Doctor Sister Mary Catherine. She wasn’t “teaching the controversy”. She was teaching science. In religion class we learned that God created the world and in science class we learned how the world He created actually worked and there was no contradiction because as far as the Church was concerned the biblical story of creation was just that, a story. That’s part of what we were taught in sixth grade, that the bible is full of stories that are just that, stories. And myths, legends, and fables, with the same amount and same kind of truth as is found in all stories, myths, legends, and fables. Which is quite a lot and meaningful, it’s simply not literal truth. And that, of course, is a way of saying that large portions of the bible, particularly of the Old Testament, are not literally true. Sixth grade religious ed wasn’t taught by a nun. It was taught by one of our lay teachers, Mr Schick, one of my favorite teachers of all time. He also taught history, which was far more important to me than religious ed, altar boy that I was, and health, and he oversaw us altar boys. I probably learned more from him that year than I learned from all my other teachers in all my years at that school, and, as you would guess, they were not a bunch of slouches. Mr Schick’s religion class was devoted to reading, studying, and understanding the Old Testament and a key thing we were to understand was that there was no historical or religious basis for believing many of those old stories and the upshot of that was that we didn’t need to believe in the stories of Adam and Eve or Noah’s Flood or any of the bible’s other tall tales to be good Catholics. This wasn’t enlightened on the Church’s part. It was chauvinistic. We were being taught how the New Testament superseded the Old Testament in order to provide us with an intellectual basis for believing that Christianity superseded Judaism. Mr Schick told us about the Red Sea versus the Reed Sea question and how it was an example of the mistranslations the English bible’s plagued with, and, although I don’t remember him out and out saying it, if you think about it, if there was no miracle that saved the Israelites then God’s Chosen People begin to seem a little less chosen. Sister Herman Joseph told us "A stiff wind, I'm talkin' about a breeze stiffer than the highball Father has after dinner, could part the waters.Never be too quick to write off as a miracle something just because **you** don't understand it. Maybe it's not so much a miracle as a sign that you need to study up." So the Church was busy all over the place creating little skeptics. The risk for the Church here is that once you show how one miracle was probably not a miracle, you’ve called into question all miracles. If God didn’t work that way for His Chosen People then maybe He doesn’t work that way for their supposed successors either. Maybe he doesn’t work that way at all. Or work at all. But apparently that was a risk the Church was willing to take with us, I guess preferring that we lose our faith than grow up willful ignoramuses. If you’re thinking the Church has come a long way since Galileo’s day, it has, but keep in mind that what got Galileo in trouble wasn’t as much his science as that he didn’t take it through proper channels. This is another upshot of teaching that the bible is not literally true: if it isn’t or if all of it isn’t then how do you know what parts of it are true? How do you know what to believe and what to believe in? At any rate, sixth grade was a very long time ago now, which is why I’m getting a kick out of seeing Mr Schick’s lesson turning up now as SCIENCE! There's a lot of debate on not only where the "Red Sea" or 'the Reed Sea" was. The Nuns and Mr Schick were following a tradition of thought that went way back to St Jerome, who also struggled with the meaning the Hebrew Words "yam sup" (Can't make all the right extra markings to get the Hebrew transliteration.) People who speak English like us, really like the "Red Sea" versus "Reed Sea" debate. The "is it one e or two e's??" makes the debate easy to teach. The Hebrew Meaning and multiple translations make it even harder. The linked article has a theory that's been around for a long time. It goes great with a view of the story as as literal as possible, but throws out the Magnitude of the Event. The other theories do place it in the Red Sea and as the result of a major Tsunami perhaps caused by the Volcanic Eruption at Santorini that destroyed the Minoan Civilization. (known as Thera eruption ) I used to like the old strong winds over the sea of reeds making a dry path. I felt a bit more "Scientific" and not following the God does Mircales explanation shortcut. But these days I go with a more Hebrew Historical Perspective. In some place, still unknown, a major Tsunami did wipe out a large portion of the Pharaoh's Army (more likely his personal contingent). The real point in the view of History in the Bible is that God is in charge and writing History. The Israelites came to "The Sea of the End" (The more likely translation of "Red Sea" ) They had come to the End of History and there God/ Yahweh/Elohim opened up a New History for them and the world. The Volcano eruption as the cause is so perfect with that theme. The end had been reached by the two great civilizations at that point. But the new beginning would lead to the Greek and Roman Civilizations and the Jewish people. The meeting of the two would then lead to our Western Greco-Roman-Jewish Civilization. So was Mr Schick right? Of course! He is Mr Schick! I'm still amazed at how much i remember from what he taught. But then He was wrong. They forgot to think Big Enough. Merry Fourth Day of Christmas from Old Mother and Father Blonde's little cottage in the vale, where we've come to celebrate New Year's with Mrs M's kith and kin, having spent Christmas Day at with Mom and Pop Mannion at the Old Mannion Homestead among her in-laws. The gang's getting ready to head to bed. Not me though. I’m looking forward to having the living room to myself. I’ve got plans. I’m looking forward to a solitary glass of egg nog and settling in to read more of Dostoevsky's Devils by the light of Mother and Father Blonde's two Christmas trees. I did this at Mom and Pop Mannion’s Christmas night, read Dostevsky by the Christmas tree lights. I did it every night of the week leading up to Christmas back at our place. I’ll be doing it this weekend when we’re back home. Rate I’m going I’ll still be doing it next Christmas. People have frowned doubtfully when I’ve told them Dostoevsky’s been my Christmas reading this season. I used to read Dickens every Christmas but then I realized I had him memorized and all I needed to do was pick up one of his books and I instantly had it re-read in my memory. I switched to Trollope for a number of Christmases but then I reached a limit. Couldn’t face one more visit to Barsetshire. I don’t know what possessed me to try Dostoevsky this year. (Get it? Possessed me? Devils is a more accurate translation of the title of the novel more famously known in English as The Possessed?) But it’s turned out to be a pretty good substitute. Of course Dostoevsky’s novels aren’t known for warming hearts and inspiring feelings of coziness, snugness, and good fellowship. But he was a big admirer of Dickens and has something of Dickens’ sense of humor, satirical eye, and affection for eccentrics. Are you saying Dostoevsky’s funny, Lance? At one time it was reported about the town that our little circle was a hotbed of nihilism, profligacy, and godlessness, and the rumour gained more and more strength. And yet we did nothing but indulge in the most harmless, agreeable, typically Russian, light-hearted liberal chatter. “The higher liberalism” and the “higher liberal,” that is, a liberal without any definite aim, is only possible in Russia. It was probably that passage that was at the back of my mind when I was watching the chess players at Barnes & Noble last week. Come on. I can’t be the only one who thinks that scene’s a gas. That’s good, he said. Now let’s begin with the obvious part, something we can agree on. This diagonal line on the left---which of the two diagonals on the right does it extend to? The top one, I answered. Of course it does, said Zafar. Now take this other napkin and line it up to check you’re right. Humor me. I should have should have seen it coming. As I brought the edge of the folded napkin against the diagonal in the top left of the diagram, it became apparent that this line extended downward not to the top diagonal, as I had said, but to the bottom one. This is Poggendorff’s illusion, said Zafar. Johann Poggendorff, he continued, was a nineteenth-century German physicist and the creator of a number of measuring devices. Your father will probably have heard of him. There are countless optical illusion of a similar type---you probably know the Müller-Lyer illusion: two parallel lines with arrows at the end, arrows inverted at one of the lines; which line is longer? I know that one, I said. But it’s Poggendorff’s illusion I like the most, because it reminds me of the distinction between a reason for doing something and an incidental benefit of doing it. But I’ll come to that. You say that once we know how the world actually is---once we see it correctly---we can fix things. Now that you know what the truth here is, let me ask you one more time: Which of these two diagonals on the right, the top one or the boom, which of them looks---and I mean looks---like it’s the extension of the diagonal on the left? The same. Nothing’s changed, I replied. It looks the same as before. Knowing how things are doesn’t make you see them correctly, doesn’t stop you from seeing things incorrectly. Stare at the image as much as you like, it’s all in vain. It will never surrender the truth, not to your naked eyes; you have to go in armed with a straightedge. ---from In The Light of What We Know by Zia Haider Rahman. Friday, December 26. New posts below. But please read this before scrolling down. It's been a hard year, as you know. We're beginning to see some light at the end of the tunnel, thanks to Mrs M's good news, but it's still going to be a difficult haul to the end of the month as we try to catch up. So if you like what goes on around here and you can swing it, please consider making a donation. It'll be a real help and much appreciated. Thanks again to all who have donated. Thanks to all of you for reading the blog. I think we might all be a bit happier with ourselves and each other if we could refrain now and then from viewing the world from high in the saddle of our favorite political hobby-horses. You’d think he’d have mechanic elves who normally handle this, but probably he gives them Christmas day off. Unions, you know. Our local garage. Eight-thirty, Christmas morning, 2014. Merry Christmas from all of us here in Mannionville! Lance, Mrs M, Ken, and Oliver! Tuesday afternoon. December 23, 2014. At Barnes & Noble---Sorry. This isn’t another dog story. It’s not a story at all or even an anecdote. Just a sketch.---the regular cafe tables along the front windows had been taken out and replaced with school cafeteria-style folding tables, four of them, set perpendicular to the window wall. On each of three of the tables were three chessboards. The fourth table was shorter and only two chessboards fit. At each chessboard a game was in progress. Eleven chessboards. Eleven games. Twenty-two men sitting silently, studying their next moves. And they were all men. Ranging in age from late teens to sixty or so. No boys. No old men. No women or girls of any age. All the men had beards or mustaches but all of individual style and trim, their idiosyncratic relationships with their razors likely a tonsorial coincidence and not a sign of cultural or religious affinities. All the men had dark hair, except the old men who’d turned gray, but there was enough color left on their heads or in their beards to show that they had once been dark-haired too. The resemblances stopped there and didn’t seem to be familial or ethnic. It was…aesthetic. It was as if somebody had cast them for effect. To make the scene suggestive of a pen and ink sketch. This wasn’t a tournament. There were no clocks on the tables. There was no one about who seemed to be acting as a referee. There were no onlookers silently kibbitizing the way people watching chess try not to do but sometimes can’t help themselves from doing with raised eyebrows, deepening frowns, slight shakings of the head, lifted chins, approving nods, or sudden stiffening of backs and shoulders as their attention is riveted by an unexpected mistake or successful surprise gambit. None of the players seemed to have brought his own chess set. All the sets looked like the inexpensive kind with plastic pieces in the classic style, the kind sold by Barnes & Noble, as a matter of fact. Probably, then, this was something sponsored by the store on a regular schedule, although there’s nothing about it on the store’s webpage. A friendly gathering and that was it. Nothing to wonder about except to wonder how it happened that so many men of working age were all free to while a way a weekday afternoon playing chess. But then I was there. Maybe they were all college professors and students on break. I couldn’t deduce any occupations from the way they were dressed which was mostly in fleece and flannel and khaki and twill with no bright colors. Whatever they all were and whatever had brought them together besides an interest in chess, if there was anything else, what I thought of them was, Devils. Or Demons or The Possessed. However you prefer to translate the title of Dostoevsky’s novel. The Oxford World’s Classics edition I’ve been reading (at night, by the lights of the Christmas tree while listening to carols, which is not as incongruous as you might think) is titled Devils. That’s probably why I saw what I saw in this group of brooding men, their features and coloring darkened by their sitting against a background of mist and fog, the parking lot out the window and the streetscape beyond and the landscape and the riverscape beyond that fading gradually into the grayness until the wooded cliffs on the far side of the Hudson were all but lost, shadowy suggestions of themselves: something sinister and political and foreboding, a scene from a Russian novel come to life. Congressional Republicans are planning to block the reappointment of Congressional Budget Office director Douglas Elmendorf. Under Elmendorf’s leadership, the CBO has had the bad habit of finding that Republican budget proposals that don’t add up don’t add up. The Republicans want a director who isn’t such a stickler. According to Bloomberg’s Dave Weigel, there are conservative economists and analysts who think this is a bad idea. They think Elmendorf’s training, experience, and history show him to be the right person for the job of running the non-partisan CBO. But it’s Elmendorf’s non-partisanship that rankles Republicans. Arguments that he’s unbiased are arguments against him in their minds. If you’re not biased for them, you’re biased against them. Republican lawmakers who have questioned the office’s analysis were unmoved. They agreed with calls from incoming House Budget Committee Chairman Tom Price for a new director who might introduce so-called dynamic scoring to CBO analysis. Dynamic scoring is the idea that policy changes can induce significant macroeconomic effects, such as tax cuts partially paying for themselves. Dynamic scoring is the “idea” that what reality has proven time and time again doesn’t work will work this time if we all believe it and clap loudly enough. It works by taking into account the fact that wishes are horses and beggars will ride. By the way, that’s Doctor Tim Price who’s the incoming chair of the House Budget Committee. Doctor as in M.D. not Ph.D. in economics. This continues the Republican principle that not being qualified to know what you’re talking about on a given issue qualifies you to oversee legislation dealing with that issue, e.g. climate change denialists and creationists on various committees dealing with science. A budget committee chair who may not be able to add and subtract but can set a broken bone---Price is an orthopedic surgeon---is apparently just what the country need to get this its finances under control. Once upon a time there was a joke going around that the Republican Party was the Party of Ideas. What made the joke really funny was that Ronald Reagan was President at the time. Unfortunately, many Republicans and many members of the Washington Press Corps and punditocracy didn’t get the joke. They didn’t even know it was a joke. The Republicans have had one over-arching “idea” since 1933 which they’ve been pushing and pushing over and over again and that’s been to repeal the New Deal and get the nation back onto the firm economic footing it was on on October 28, 1929. Every “idea” they’ve put forth since has been a rephrasing of that original one and every single reiteration has boiled down to “Let the rich run the place like it’s their private toy room”. They’ve just hired generations of skillful admen to find different ways to dress it up in words that sound smart, if you don’t think about what they mean, which is nothing. Undressed up by admen, it amounts to this: Don’t tell me how to make money. Don’t tell me what to do with my money. And don’t dare tell me I should share my money. I don’t owe anything to anybody. My money. My country. I get to do with them whatever I want and anything that tells me that’s not a good thing is going to get tossed out the window. Read all of Weigel’s story, Republicans Block Reappointment of CBO Chief Doug Elmendorf, at Bloomberg. There are teaching orders. There are nursing orders. There are missionary orders. There are orders that work with the poor. And there are contemplative orders. As far as I know, there are no ranching orders, per se. The Benedictines are mainly a contemplative order, but their motto is Ora et Labora---prayer and work---and they do other things besides spend their days in prayer. 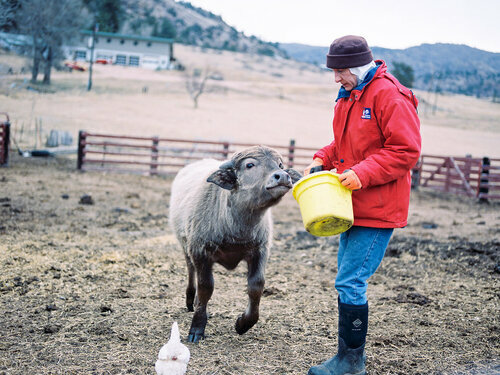 For instance, the sisters at the Abbey of St Walburga in Colorado do some ranching. Cattle ranching. Chicken ranching. Water buffalo ranching. Llama ranching. To keep the baby cows safe from the region's numerous predators, the nuns employ a set of unorthodox security guards — the aforementioned llamas. "We have seen them chase a mountain lion off the property," [Sister Maria-Walburga] Schortemeyer says. "Llamas have various weaponry. One of them is their breath. They also kill with their front feet. They try to disembowel you — if they were upset with you." That's right, a disemboweling guard llama raised by nuns. The sisters say the llamas usually save their spit and hooves for intruders, not the nuns who feed them. The sisters also do some beekeeping and cheesemaking or they will be making cheese once they get certification for their cheesemaking operation. They plan for their cheese specialty to be mozzarella made from the water buffalo milk. They do some blogging too. You can read and listen to the whole story, Nuns On The Ranch Give A Heavenly Twist To Beef, at NPR. Their beef, by the way, goes to market and is grass-fed. We hope all of you who are celebrating are having a Happy Hanukkah! Run, Elizabeth, run…run far away and don’t look back! Image courtesy of MoveOn.org. Click on the picture or here to watch the video. Warning: it’s also a link to MoveOn’s donation page. I understand the argument behind getting Elizabeth Warren to run for President. It would be good for the party and, actually, good for Hillary, and not just because it might drag her to the left on economic issues. (She doesn’t need to be dragged to the left on other issues. She’s already there. As for the one big other she does, Warren wouldn’t be doing much campaigning on foreign policy). The worst thing a front runner like Clinton can do is run as a front runner. Tortoise and the hare etc. But Warren’s getting into it would also make things interesting and that would get voters interested. It would bring out more of the less than reliably faithful. The reliably faithful would be riled up. The political press corps would pay attention. What’s more, since they’ll be rooting against Hillary all the way, they’ll pay attention to Warren and not to Rand Paul or Jeb Bush or whichever Republican they decide they’d rather see win than have to suffer through more proof voters don’t agree with them that the Clintons are the source of all evil. So, yeah, I can see the good of it. It would be fun. It would be exciting. And it would help the party up and down the ticket. Warren could get the message out that the Democratic Party is the party looking out for the 99 percent. She could make that the message. It’s not enough for voters to be ready for Hillary. They need to be ready for the Democrats running to represent them in Congress and in the state houses and legislatures. Those Democrats need to be encouraged and inspired to run as if they’re ready to be Democrats. I’m not sure why she should want to. Why should she volunteer to lose every primary, rack up enormous debt, wear herself out on the campaign trail for the next two years, taking time away from the important and good work she’s doing in the Senate and from where she’s already getting the message out? For the good of the party? For the good of the country? Or just to make us progressives feel good about ourselves? This has been an ongoing complaint against the lefty-er than thou among us. We don’t want to win. We want to be right. And I’m afraid there’s more than a little truthy-ness in this. I think a lot of people on the left (and right) look to politics for more than political vindication. They’re desperate for personal validation. They need to know they’re not just taken into account by the world at large but that they are central to its running and purpose. They don’t like feeling left out, left behind, pushed aside, marginalized, ignored, powerless. It’s the old the world would be a better place if everybody thought and felt like me syndrome, but what’s behind it isn’t simply narcissism or wounded vanity. It’s a desire to belong. We want to feel valued, we want to feel safe, we want to feel we’re an important part of things, and who would be most sympathetic to those feelings if not perfect mirrors of ourselves? What we really want is to be loved and cared for. This is why humans created God and why God created sports teams. It’s not what politics is for but it is something good politicians see it as part of their job to do. It’s probably an apocryphal story but it’s been told and told again---I heard it again most recently in Ken Burns’ The Roosevelts---and it goes like this. The day FDR died a man was walking down the street and came across another man down on his knees, weeping openly and unconsolably. I’ve said a number of times since he became President that I wish President Obama was a little better at letting us know that he knows us. But I try to keep in mind that he’s often not talking to me and that the people he is talking to do know that he knows them, and I wish more privileged white guys like me would also try to keep it more in mind. A lot of people feel Hillary knows them, something else privileged white guys should try to keep in mind. There are other things to being a good liberal besides railing against the banks. Still, I understand why many people feel that Elizabeth Warren knows them or at least knows them better than Hillary does. For the record, I feel like Hillary does know me and my family. But I’ve talked to her. I heard the delight in her voice when she asked me to thank Oliver for her for donating his allowance to her campaign. I heard the catch in her voice when she said in a conference call that she was “tired of fighting those battles” over and over. She meant the battles for women’s health and economic well-being which, and let’s not lose sight of this, are battles for the health and well-being of families. The war on women is a war on men and children too. And I watched her when she was running for Senate the first time and then with increased effort and effect after she won and for as long as she served to turn herself into a great representative and advocate for New York State. This is why I was for her in 2008. It wasn’t that I thought she was better on the issues than Barack Obama. It was that she was emphasizing the issues that mattered most to me and my family with more force. I think it’s the case again, that it’s a matter of emphasis, only this time it’s Elizabeth Warren who’s placing the emphasis more on where I’d like it placed. And one of the good things I think Warren could accomplish would be to force Clinton to shift her emphasis or, rather, re-emphasize certain concerns and stop sounding so concerned about the care and feeding of millionaires and the vanity of generals. She’s been sounding a little too hawkish lately and far too much as though she thinks that if she just keeps the bankers happy and feeling good about themselves they’ll leave what’s left of the middle class alone. Let me repeat, though, on issues of foreign policy and defense I wouldn’t expect Warren to have much success dragging her to the left or to even really try. That’s why I’d kind of like to see Bernie Sanders get into it too. Also, I heard Hillary talk live more recently than 2008. Back this past September, at the Clinton Global Initiative. If she didn’t sound like she knew me, she sounded like she knew a lot of people I know and worry about. What it gets down to, though, is this. I’d like to see Warren run in order to inspire Hillary to run better. I don’t mean better than Warren, not in the sense of running better enough to beat her. I don’t think she has to worry about that, although, like I said, it’s not a good strategy for the hare to run as if her winning is a sure thing. I mean as a better Democrat. I don’t want Warren to beat her. I don’t think she could beat her. Anyone pointing to 2008 as a precedent for Hillary’s losing a nomination she was supposed to have sewn up needs to remember that late in 2007 there were three strong Democratic presidential contenders and Hillary was the front runner among them by virtue of the other two splitting votes in the polls. But I’d like to see Hillary running as if she needs all of Warren’s potential voters to win. Which she very well might come the general election. There are, though, many progressives who want Warren to run and take the nomination away from Clinton. I don’t think there’s a hope in hell of this happening, but what do I know? MoveOn sent me a newsletter that seemed to expect that I would be impressed that a hundred people turned out for a draft Warren rally in Iowa last week. “Standing room only” it said, describing a room probably designed to hold sixty. But political movements have to start somewhere. I suppose some of the people at that coffeehouse were looking for personal validation. But many of them probably think the world of Warren and are convinced that if she runs enough voters to make her President will come to think the world of her too. Some of them probably just think she’d make the better President. Obviously, I don’t agree. In fact, I think a President Clinton who has to deal with a Senate in which Elizabeth Warren is chair of the Finance Committee will be a better President than a President Warren who wouldn’t have anybody like a Senator Warren on her side. But, again, what do I know? And some of the people there plain don’t like Hillary. Lots of reasons for that. Of course, I’m assuming all of them want Warren to run as a Democrat. They aren’t hoping that after Hillary wins the nomination Warren will stay in the race as an independent and help get Rand Paul or Jeb Bush elected President because it’s better to be right than to win and that sort of thinking worked out so well for progressivism in 2000. …unless it’s already in the mail or unless I don’t have your address. Send me an email with it if you’d like a card and name your household holiday(s) so I can be seasons greetings-appropriate. I’m not kidding. Somebody’s got to save the Post Office. The Mannion kitchen table. Seven o’clock, Saturday morning. December 20, 2014. Revised and corrected Saturday evening, December 20, after an editorial consultation with Oliver Mannion. A marriage and a revolutionary theory of time begin together in a discussion between Jane Wilde (Felicity Jones) and Stephen Hawking (Eddie Redmayne) about the phosphorescents in a brand of laundry detergent in the real life love story The Theory of Everything. Serious spoiler warning: If you’re even broadly familiar with the life and work of Stephen Hawking and the story of his marriage to Jane Wilde, nothing below will count as a spoiler. If you don’t know any of that, I’m jealous, because then the movie’s going to be filled with wonderful surprises for you, but you’d better not read my review until after you’ve seen the film. The Theory of Everything is one of the most beautiful real-life love stories I’ve ever seen brought to screen, spoiled in the end by only one thing. The lovers, Stephen Hawking and Jane Wilde (played in the movie by Eddie Redmayne and Felicity Jones), do not live happily ever after nor do they die in a tragic, romantic, and cathartic way that lifts the spirit and enlarges the soul even while breaking the heart, because they didn’t. They are both still alive and although the story of their love reached its final chapter it didn’t so much end as wind down. It’s hard to provide a satisfying conclusion and stay true to a story that finished without concluding anything. That’s real life, but it’s a problem for honest filmmakers like The Theory of Everything’s director James Marsh and screenwriter Anthony McCarten. Marsh and McCarten might have saved themselves the problem by making The Theory of Everything less of a love story and more the story of a marriage, which it also is anyway, or by emphasizing the other story they tell along with the love story, the story of a good woman who fails at being a saint. But they prefer to tell us the love story and for two-thirds of the movie it’s exquisite: touching, heart-rending, heart-swelling, often funny---true love is a comedy, while it lasts---often painful, often funny and painful as in laughing through the pain, finally tragic---for Jane---but, like I said, beautiful, especially at the beginning, which is true of all love stories. 1963. Cambridge, England. Stephen Hawking, a doctoral student at the university and Jane Wilde, who is studying Medieval and Early Renaissance poetry at a college in London, meet at a party where they fall in love in an exchange of two words. “Science,” he says. “Arts,” she replies. Both sound a bit apologetic. Neither needs to be. They’re both curious and open to ideas and experiences beyond their ken. They find joy in small pleasures. They don’t want anything. And most important: They understand each other. Not in the sense that she can follow his math or that he’s fascinated by the linguistic nuances of Fourteenth Century romantic poetry but she understands why doing the math makes him happy and he understands the same about her work translating that poetry. Typical college students of the time might have said they dig each other. Jane and Stephen aren’t typical. My favorite scene in the whole movie is at the party when Jane and Stephen have found a little bit of privacy on the stairs to an upper floor in the house. They’re just sitting there talking, oblivious to people who have to step around them on their ways up and down. They’ve clearly been there for hours. We don’t hear much of what they say, but it doesn’t matter. We know what the conversation is about: learning that they were each right to be smitten with the other. It’s one of those lucky moments that should last forever, that in a way does last forever. And it’s wrenching when one of Jane’s friends comes to drag her away and breaks the moment. It’s thrilling, then, when Jane comes dashing back to press a piece of paper with her hastily scribbled phone number into Stephen’s hand: Cinderella returning to the ball to make sure the prince finds the glass slipper. Jane’s no pushover, though. She knows Stephen’s fallen just as hard for her as she has for him, but she still expects him to prove it. He has to court her. And he does. To her astonishment, undaunted by her initial rebuff, he shows up outside her church on Sunday---she’s impressed because it means he bothered to find out what church she attends---and invites her to dinner with his family of prickly and proud eccentrics. They’re a formidable bunch, close-knit, protective of each other, intellectually snobbish, and united in their awe of Stephen, who’s the prince of the house. Jane has to earn her welcome. His sisters and mother make it plain they don’t think she’s worthy of Stephen, mainly on the grounds that nobody is, and his father puts her to the test. But Stephen is the prince and one of his rights as a prince is the right to choose his own princess. He makes it clear he’s chosen Jane. “I’m taking Jane to the May Ball,” he announces, without having asked Jane herself yet. He takes care of that formality right there, with a mischievous look across the table and a wag of his eyebrows (that’s going to become a signature of Redmayne’s performance) and she accepts with a teasing grin and an admonishing shake of her head that lets him know he’s being let off the hook but he’d better do it right in the future. And at the ball, an outdoor affair with fireworks, Jane gives science her first of many gifts. Stephen, a brilliant but an up till now unambitious to the point of lazy student, has been idly casting about for a topic for his dissertation and through a seemingly trivial discussion of laundry detergent he’s inspired. It’s not a simple jump. It takes a couple more scenes to work it out but he figures out what he’s going to do. He’s going to explain Time. And Jane’s part in this is to understand that it can be done and he’s the one who can do it. Sadly, there’s not going to be a reciprocal gift for her from him. Circumstances won’t allow for it. He receives the fateful and as far as any one involved knows fatal diagnosis. He has two years to live. Naturally, Stephen’s devastated. And his reaction is to hide himself away in his rooms where he apparently intends to stay and wait to die. But Jane is made of sterner star stuff. “We’re going to beat this together,” she declares. By “this” she doesn’t mean the disease. She doesn’t mean death. Jane isn’t fooling herself. She knows the facts and she’s strong enough and intelligent enough to face them. She means despair. She won’t leave him alone to wither away as he thinks he wants her to. She determines to keep him alive in the sense of making the most of the time he has left. She keeps him moving, keeps him hoping, keeps him working. She saves him from himself and saves him for herself. And she saves him for science. But the reason she’s able to save him for science is he does not die on schedule. Which turns out to be for Jane what believers in God like her call a mixed blessing. She gets to spend many unexpected years with the husband she adores. She gets children, three of them, all happy and healthy. And she gets twenty-five years of unappreciated self-sacrifice, self-abnegation, loneliness, and physical, emotional, and spiritual exhaustion. And the only pure pleasure she’s offered that doesn’t require complete self-denial comes in what for her is the cruelest form of temptation. Redmayne is receiving a great deal of acclaim for his portrayal of Stephen, and he deserves all of it. He’s worked one of those Daniel Day Lewis-Meryl Streep-like tricks of magic in which they appear to replace themselves completely on screen with their character and become, as Lewis did with Lincoln and Streep with Julia Child, more like the people they’re playing than those people are themselves. In Theory of Everything, Redmayne comes across as more like Stephen Hawking than Stephen Hawking is like Stephen Hawking. And it’s a physically exacting performance, complicated by the movie’s not having been shot in sequence. Redmayne had to contort himself into a wheelchair for one scene, be on his feet and limber for the next, any of many various stages, postures, and ranges of movement in between for the scene after that, and then go back to where he’d left off in the morning or the day before or the week before. Then, of course, in many scenes he couldn’t talk, couldn’t gesture, couldn’t suggest any emotion or thought through the slightest shirk, shrug, or tilt of the head. He had to express it all through the little controlled movements Hawking was left with: the lifting of one corner of his mouth, the wagging of his eyebrows, the shifting of his gaze. And it’s amazing to watch him at this stage doing more than showing us the person trapped in the broken body but showing us that person using what he has to be the person he always was. All of Stephen’s wit, intelligence, feeling, mischief, and charm come through as vibrantly and vitally as they do in the scenes in which Redmayne could put his voice and whole body to work. And in the first part of the movie, when he can move, he moves beautifully. As impressive as he is portraying Stephen in the final stages of his physical decline, he’s just as adept at revealing its very beginnings. One of the surprises of the movie is that Hawking was actually rather physically active before the onset of his disease. He liked to ride his bike and take long walks. He was a coxswain for the rowing team, although his passion was, of all things, croquet. It’s subtle and it takes a while for it to register that the charming clumsiness that causes him to spill a cup of coffee on an exam paper isn’t the sign of an absent-minded professor type who spends too much time in his head and not enough time in the gym. But for all that, I think the moments I liked best were when we watch Stephen working at a blackboard or just sitting quietly as he’s carried away by an idea. The Theory of Everything doesn’t go very far into Hawking’s scientific work. Mostly, Stephen’s genius is seen in its effect on others. Marsh puts him in the company of other geniuses and lets them convince us what Stephen’s come up with is impressive by acting extremely impressed. (He does something similar to convince us that despite Stephen’s eccentricities he’s a popular and good-hearted young man by surrounding him with a gang of good-hearted young men.) But the clincher is the look on Redmayne’s face when he’s caught up in his thoughts. It isn’t a look of genius. It’s a look of pure joy. Jones’ work is, necessarily less showy, but it’s equally as brilliant although she has an almost opposite challenge. His performance is an act of self-transformation; hers is one of self-effacement. Jones’ job on screen is not unlike Jane’s with Stephen’s: it’s up to her to clear space around Redmayne so he can do his more attention-grabbing work. And, also like Jane, she is mostly on her own. Redmayne has the actors playing the impressed scientists to work off of. He has the actors playing those good young men. He has Jones. But Jones is very often alone in a crowd. When Jane isn’t being ignored she’s withdrawing or even running away from others. Redmayne can’t help calling attention to his performance with his every movement. Jones, however, has to grab and hold our attention at the same time Jane is failing to grab or hold the attention other characters or when she’s pushing it away. She has to be seen while trying not to be seen trying not to be seen. And then she has the additional, tricky challenge of playing someone who is almost wholly good while not making her too good to be true and at the same time not overplaying her flaws and foibles to the point we lose sight of her goodness. To put it starkly: how do you play someone who is practically a saint and make her saintly and interesting? It’s often said that God doesn’t ask us to shoulder any burdens we’re not strong enough to carry, but that’s obviously not true. He routinely drops burdens on His children that crush them on the spot or wear them down and exhaust all their strength and will over time. Jane is a brave, determined, large- and loyal-hearted young woman forced by circumstances or, as she sees it, asked by God to accept the life of a saint---a saint being defined as someone who lives her life entirely for others, which for Jane means for her husband and children---and for a time she succeeds and even appears to triumph. She is saint-like for as long as she can hold up---which doesn’t mean she’s without ego, doubt, or ill-feelings or immune to temptation---but eventually she stumbles and falls and can’t get up. God, the version of God she believes in, the loving, caring, care-taking God who involves himself in our daily lives---the one her cheerfully non-believing husband calls a celestial dictator---has asked too much of her. She’s not a saint. She’s just a good person who can’t take any more or give any more because God has worn her out with his demands. This is tragic because that God doesn’t exist, even in the movie. But like I said, Marsh and McCarten are honest filmmakers. And I suppose you could, as I did, try to find a happy ending by seeing what happens as a kind of transcendence on Stephen’s part. It isn’t, as I can’t help suspecting it was in real life, a selfish decision on his part to give himself what Jane had had to deny herself all those years when she lived entirely to take care of him, the freedom to live entirely for himself and his work. He isn’t rejecting Jane or abandoning her and the children. He’s just reached a point in the intellectual (and even spiritual) journey he’d begun before he and Jane met and fell in love where she can no longer travel with him. In a not entirely metaphorical sense, he leaves the ordinary world and becomes one with his beloved science. He’s where the universe needs him to be in order to get itself explained and she got him there. It’s a triumph for both of them, even though it means they have to part. And Marsh and McCarten are a little less scrupulous on this score. In the end, though, they give us a scrupulously honest story about how marriage works…and doesn’t. We don’t fall in love with only the person we met at the party and spent the night talking to on the stairs. We fall in love with the party and with the stairs and with everybody who had to step around us on their way up and down. Love contains the circumstances under which it came into being and for it to continue the circumstances have to continue in some form. That party, that moment on the stairs has to last and be part of all the new and changing circumstances that follow. Circumstances can change to such a degree that the initiating moment is lost. We’re cut off from the source of our love. And we ourselves or, rather, the selves we were at that initiating moment are part of the circumstances and in falling love with the moment we fall in love with those selves too. Love can end not only when one partner no longer recognizes the other as the person they fell in love but when they no longer recognize themselves as the person who fell in love. In loving you, I love me. In loving me, you love yourself. Sadly, heart-breakingly, for Jane circumstances become such that when she’s with Stephen there is no “me.” This means that there comes a time when both Jane and Stephen realize a person they both need to love for the marriage to continue is no longer there for either of them. Charlie Cox is effective and affecting as Jonathan Hellyer Jones, the choirmaster at Jane’s church, a good and well-intentioned man who becomes both Jane’s salvation and, to his conscience-stricken dismay, her temptation. David Thewlis plays Dennis Sciama, the physicist who supervised Hawking’s doctoral work at Cambridge, as a man not easily impressed, because he numbers too many impressive people among his friends, colleagues, and former students, who is surprised by how impressed he is by Stephen and even more surprised by how fond he becomes of him. Harry Lloyd, as the chief among the good-hearted young men who surround Stephen in his university days, is the ideal friend, stalwart, loyal, understanding, and not about to let Stephen get the better of him despite his being a genius. As Jane’s mother, Emily Watson pretty much has only one line that matters but she makes the most of it to steal the scene. As Stephen’s father, Simon McBurney manages to be eccentrically charming while still being appalling in his selfishness and heartless rationality. And Maxine Peak plays Elaine Mason, the nurse who became Hawking’s second wife, as if the real Jane Hawking had paid her to get revenge for Jane’s sake: she’s smug, seductive, completely conscienceless, and obviously intent on coming between Stephen and Jane from the moment she picks up her letter board. The lovely watercolor cinematography is by Benoît Delhomme. Music is by Jóhann Jóhannsson and I’m downloading the soundtrack now. The Theory of Everything, directed by James Marsh, screenplay by Anthony McCarten, based on Jane Wilde Hawking’s memoir Traveling to Infinity. Starting Eddie Redmayne, Felicity Jones, Charlie Cox, David Thewlis, Harry Lloyd, Emily Watson, Maxine Peak, and Simon McBurney. Rated PG-13. Now in theaters. Jane Hawking’s Traveling to Infinity and Stephen Hawking’s A Brief History of Time are available at Amazon. And they thy comforters will be. ---The Song of the Happy Shepherd. Took the Mannion guys to Barnes & Noble this afternoon so they could do a little Christmas shopping, and naturally, after they’d bought their presents, we lingered in the cafe and while we were there lingering an announcement came over the intercom. Over in the children’s section was a special visitor to the store. The author of Monsters Do Not Know Tae Kwon Do was going to be act out the story with the help of any kids who wanted to join in. This meant those kids would get a free lesson in tae kwon do and Ken Mannion hurried over to take a look. Ken’s sport is karate, but he’s interested in all forms of martial arts and always on the lookout for tips and tricks he can work into his own routines. When he came back and started to deliver a report to Oliver and me, a customer at a nearby table interjected. He was a round-faced, white-haired, gray-goateed man in his sixties wearing a ball cap embroidered with the letters USMC and the Marine logo of an eagle perched on a globe skewered by an anchor. Sixty-something former Marines are likely Vietnam vets but he wasn’t wearing any clues about that that I saw and for all I know the cap was just a souvenir or a tribute to somebody else’s service. But I don’t believe many people who aren’t Marines, ex-Marines, or related to a Marine go around sporting Marine Corps paraphernalia. It’s a good way to irritate actual Marines. So let’s say this guy was a former Marine and a Vietnam vet. I don’t think the guy was expecting a serious answer. He thought a bit about what to say next. “Karate,” Ken said and he began to explain what style. The guy let him finish but he wasn’t really interested. He had some advice he wanted to impart. Ken got the joke, but he didn’t think it was funny. “I don’t like guns,” he said. This took the guy aback. He’d been anticipating a laugh. “Better not come to my house then,” he said. He smiled but it wasn’t the sunniest of smiles and there’d been a defensive note in his voice. I decided I needed to intervene to lighten the mood. “Are you a hunter or a collector?” I asked in a friendly and sincerely curious way. I’ve been a reporter. I know how to ask a non-judgmental question. But he looked at me suspiciously, probably wondering if this was a case of like father, like son and if he was opening himself up to having his Second Amendment rights challenged. But I waited him out, and finally he replied, although he sounded wary. This I understood. I’ve only ever owned one dog. I got him when I was in seventh grade. He died when I was twenty-nine and in all the years since I’ve never wanted another dog. He and I had been friends for sixteen years. You don’t just go out and get another friend like that. And that’s clearly how this guy felt about his dog. “What was she?” I asked. For a second it seemed as if he didn’t understand the question, but I think he was lost in a memory and hadn’t really heard it or, rather, he heard it but didn’t hear it, if you know what I mean. He had to go back and review. Then he got it. “Golden retriever,” he said. But now he didn’t seem satisfied with his own answer. Her breed was beside the point. It didn’t describe the most important thing about her. If you enjoy what goes on around here and would like to help keep this blog going strong, please consider making a donation.